The leaves started to change colors a few weeks ago, and some trees are dropping them to the ground, but today was the first day it has really felt like fall. 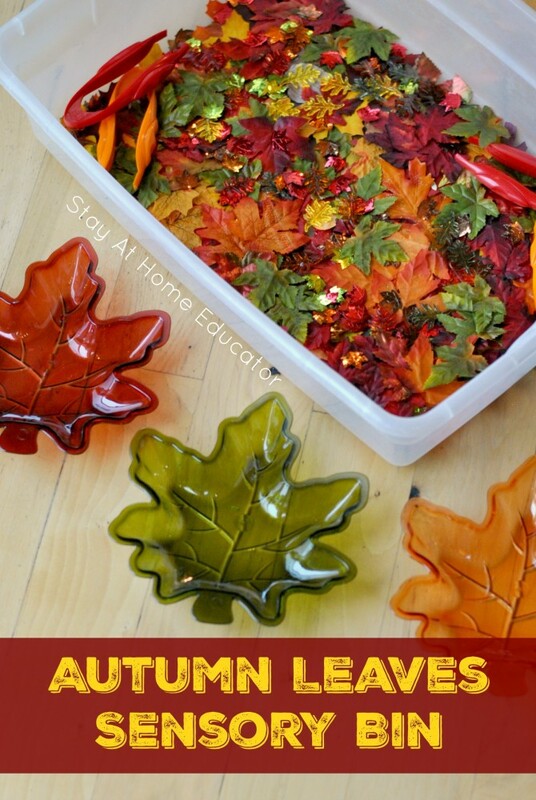 It’s raining, and much cooler, and the perfect day for an autumn leaves sensory bin. 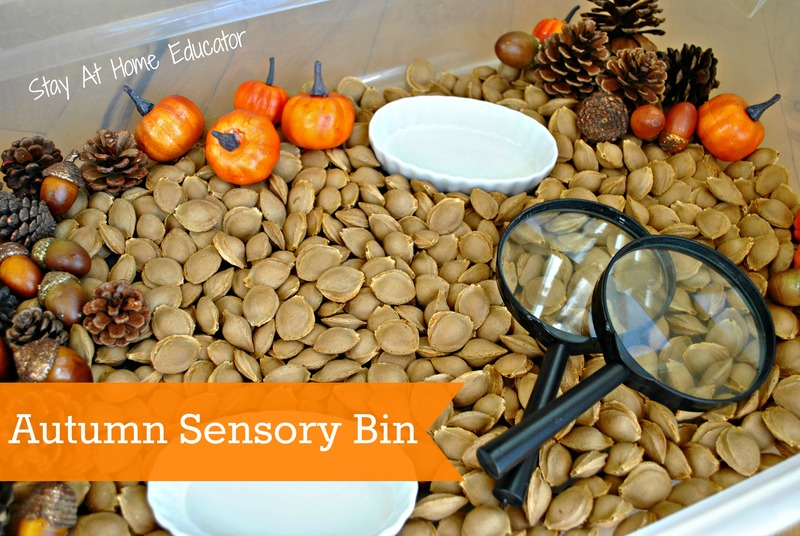 This sensory bin is brightly colored, resembling the hues of autumn. Burnt oranges, reds and yellows, with a little bit of green still hanging in there. There’s nothing but leaves in this sensory bin. No other signs or icons of autumn, so it pairs wonderfully with all the books about leaves we’ve been reading in preschool. 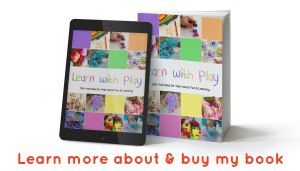 This post may contain Amazon affiliation links. 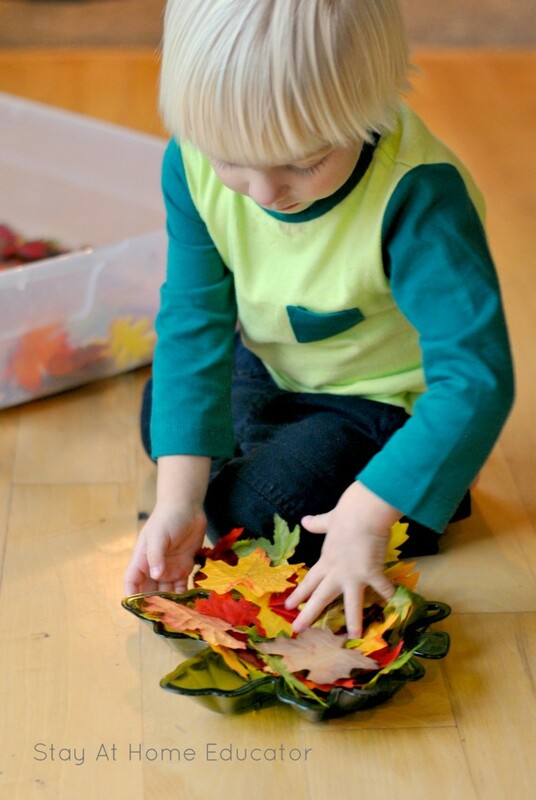 Because I wanted the small acrylic leaves and the table scatter to be visible when I invited the children to play, I started by placing a layer of silk leaves in the sensory bin, and then scattered the other materials on top. I added two jumbo tweezers, and placed leaf trays of the same autumn colors along side the sensory bin. I invited my kiddos to join me at the sensory bin, and they didn’t hesitate to dive in and begin exploring. This was not their first sensory bin, so I didn’t need to give the children any direction. Corinne immediately grabbed a pair of jumbo tweezers and tried using them to grab the leaves so she could sort them. She found that the tweezers to take too long and she quickly ditched them. Initially the leaves were sorted by color, being carefully placed into the corresponding colored leaf tray. 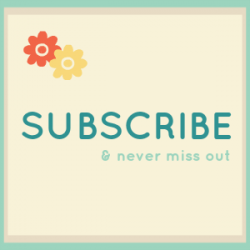 This is no supersize as children almost always begin color sorting before any other sorting. Then, they were poured back into the sensory bin, and the leaves were sorted differently this time. Corinne searched the bin for all the “shiny” leaves. 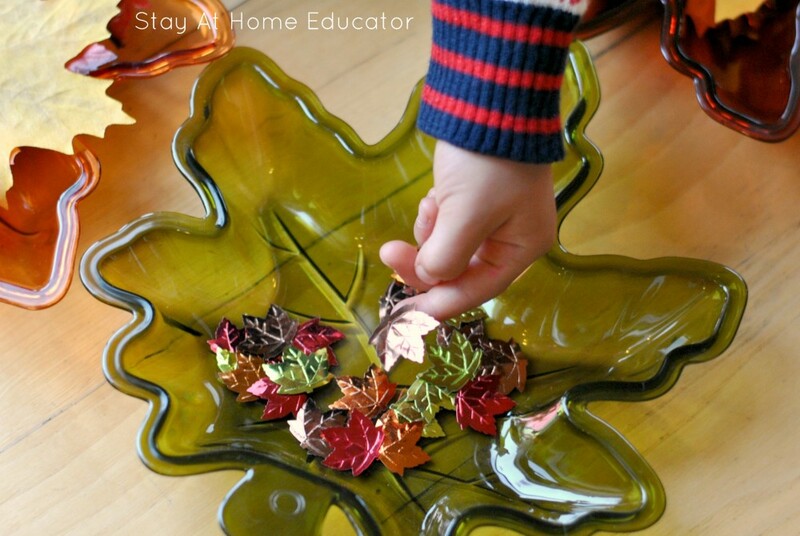 She placed all the table scatter leaves into a single leaf tray, while Kent practiced transferring the leaves from the sensory bin to a tray, any tray, and back again. While there was no coloring sorting that took place, he did have to so a bit of problem-solving as he tried to get his handfuls upon handfuls to fit into a tray that really was too small. And there was some general play, too. 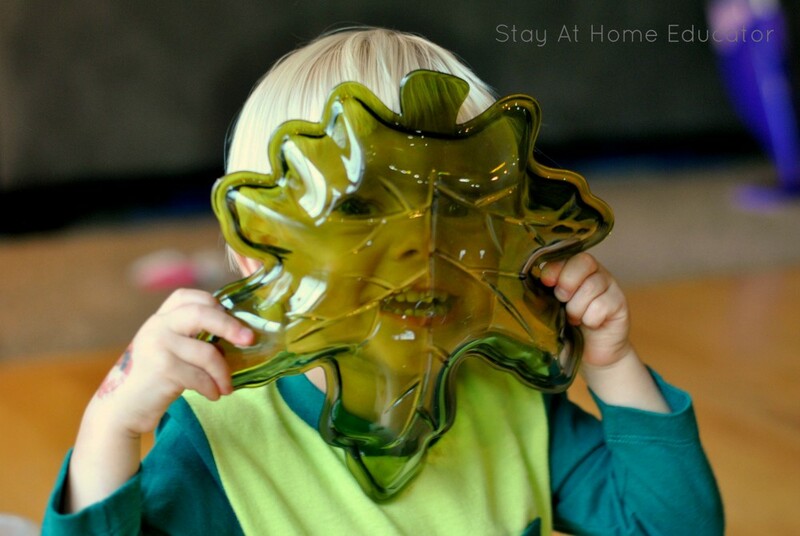 This is ok, though, as just playing with the transparent leaf tray teaches about the sense of sight and how it can be affected. It teaches that some things can change the way we see, or what we see. The autumn leaf sensory bin stayed out for quite a while. It made a great rainy day activity as well as a wonderful addition to our autumn themes in preschool.